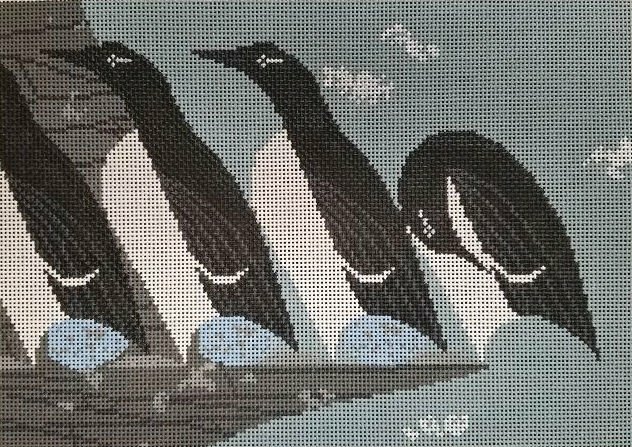 The Charley Harper needlepoint penguin design is hand painted onto 13 mesh Mono Zweigart needlepoint canvas. It features penguins on the ice and is a wonderful contemporary needlepoint design. The needlepoint design area measures approximately 8" x 12". This penguin handpainted Charley Harper needlepoint canvas is usually in stock and ships within a few days. However, due to the popularity of Charley Harper canvases it is subject to back order so if you're in a hurry let us know.